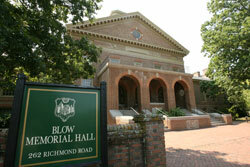 Blow Hall is located on Richmond Road (on the Old Campus across from the WaWa). You can also find us as building #210 on the campus map. The Charles Center is located on the second floor of Blow Hall, suite 254, facing James Blair Drive. On foot: Walk west on Richmond Road until you reach Blow Hall. Blow Hall is on the right across from the WaWa. By car: From College Corner (the V intersection of Jamestown and Richmond Roads), proceed west on Richmond Road to Stadium Drive. Go past the stadium to the Sadler Center and turn left on James Blair Drive. Blow Hall is on the right.